The following craft goes with the Bible lesson "Forgiveness - A Father's Day Lesson (The Story of Jacob and Joseph) on The Resource Room. This lesson is designed to help each child feel gratitude to our Father in Heaven for His great love for us and to our earthly fathers for their love and sacrifices and to teach the children the importance of forgiveness. Children color the pictures, draw pictures of their own families, and then string the images together to make a chain or necklace. Children learn and become more familiar with the names of Jacob's sons through this card match game. 1. Before class print out the Jacob's sons cards twice so you have two matching cards for each son. 2. In class mix up the cards and place them face down in the center of a table. 3. To play children take turns turning over two cards to find matches. If a child finds a match, he keeps the cards, reads the name on the cards and then the next child takes a turn. 4. The child that finds the most matches wins. This craft goes with the lesson "God Our Father" a Father's Day Bible Lesson on The Resource Room. While God our heavenly father should always have first place in our lives, our earthly fathers deserve honor. They deserve honor because they are our fathers, and God commands us to honor them. While they cannot compare to God, they still deserve distinction. This craft is designed to help children think about how they can honor their parents. They color the award and/or add a foil tape medallion that they engrave with a pen. 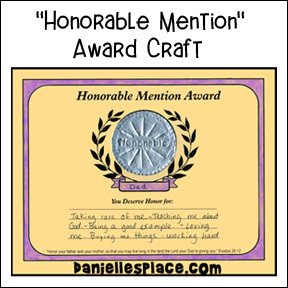 They also write why their father or caregiver deserves to be honored. This craft goes with the lesson "God Our Father" a Father's Day Bible Lesson on The Resource Room. In this lesson children compare God our heavenly father to earthly fathers. 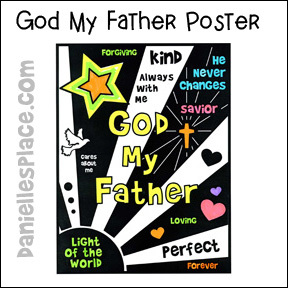 Children use colored pencils, highlighter markers, or water color paint to color the "God is our Father" poster. This coloring sheet comes in two different styles. One coloring sheet has areas that are already colored in with black. The other one has only outlines. While God our heavenly father should always have first place in our lives, our earthly fathers deserve honor. They deserve honor because they are our fathers, and God commands us to honor them. While your children color the Honorable Ribbons talk to them about ways they can honor their parents. Tell them to give the ribbon to their father or special caregiver.